I have recently designed and built a new website for my own business Ridge Design. It has been a great learning experience and has forced me to take some of the steps for my own business that I always advise my clients to take for theirs. Looking at the same website every day can make it difficult to be objective about it’s content and design so it was great to strip the website back to it’s bare bones. This allowed me to really assess what the site needed to say about my business and the type of websites I build. Why did I decide to build a new website? The main impetus for the new website design was a desire I had to freshen up my whole corporate identity. My existing website was functional but I felt that it didn’t reflect the standard of design work which I was creating for my clients and this had to change. As a website designer I get most of my work through my own website. 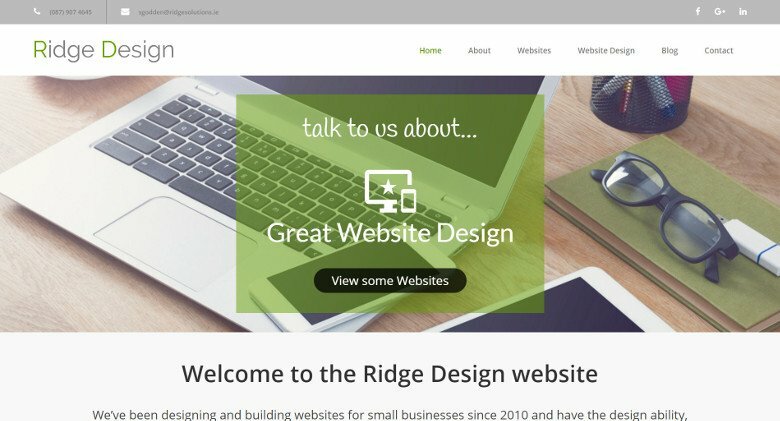 My website needs to showcase all my abilities and to let potential clients see straight away why they should choose Ridge Design to build their online presence. How did I approach this new website build? I have updated the websites of several long time clients in recent years and this experience in particular helped me with my own website changes. It’s definitely easier to frankly assess how a clients’s website has been working for them than it is to look at your own. The text content on my website in particular needed work and I had to try and look at each page with new eyes. I had to ensure that any visitors to my website know exactly what my Unique Selling Point is, what I have to offer and to ensure that this is reflected in the website content. Previous post Some more advantages to a website revamp.